It is unclear for how long a flat which served as legation premises on the first floor (above a grocer’s shop) of 17 Strandvägen had been rented by ministers before the lease was taken over by the Office of Works in 1901. With the years, it became increasingly unsatisfactory. In 1911 the minister, Sir Cecil Spring-Rice, reported that the Swedish government was prepared to offer a suitable site for a new legation for £7,000. 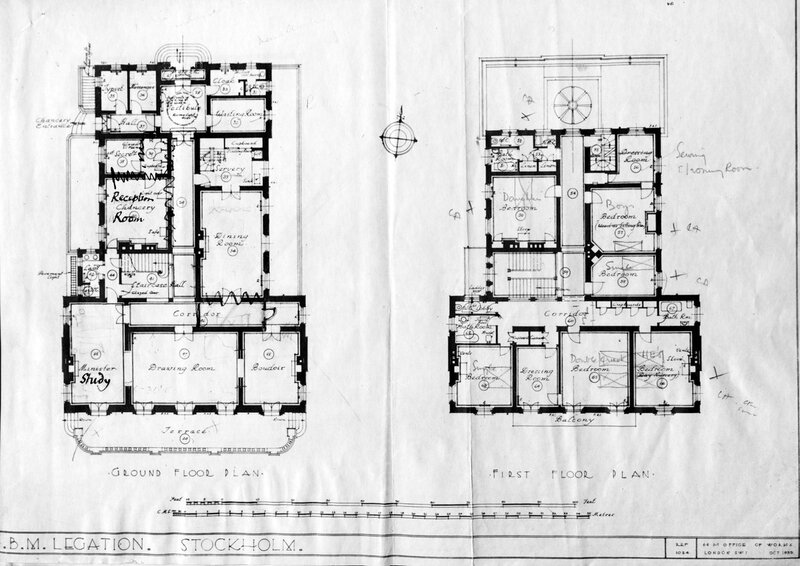 Richard Allison, an Office of Works architect (and later chief architect) visited and reported in February 1912 that all missions in Stockholm were in flats and the Swedes were anxious to encourage the building of legation houses. To date, only the Norwegians, newly independent from Sweden, were considering this. The lease on the British flat was due to expire towards the end of 1914 and Allison optimistically suggested that a new house, estimated to cost about £22,000 including the site, could be ready by then. 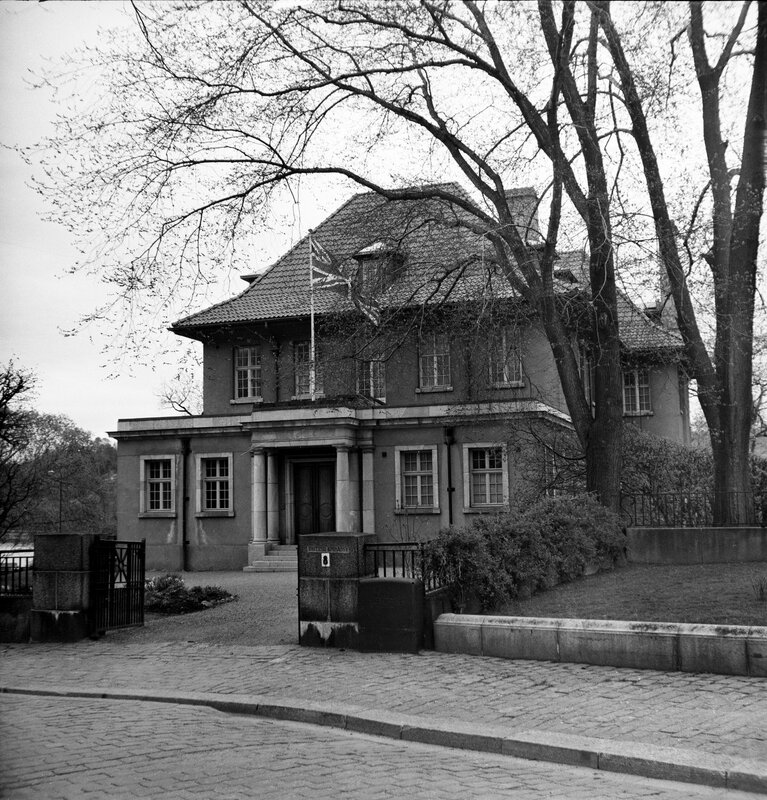 The Treasury was unusually helpful, partly perhaps because ‘It may be observed that as the future Queen of Sweden is an English Princess it is desirable on general grounds that the British Minister at Stockholm should be suitably housed.’ Allison visited Stockholm again and concluded that the 1,849 square metre site on offer in the intended diplomatic quarter beside the river and near the English church was the best available and it was bought at the very end of the 1912/13 financial year from the Swedish government for almost £9,000. The King of Sweden had laid down planning and building regulations for this sensitive area of the city but some flexibility was expected from the outset. Allison designed the building himself and clearly took pride in it because it features large in the scrapbook that he kept of his work. William John Palmer-Jones was commissioned to produce a presentation drawing, which was exhibited at the Royal Academy in 1916 (and hangs in the house). 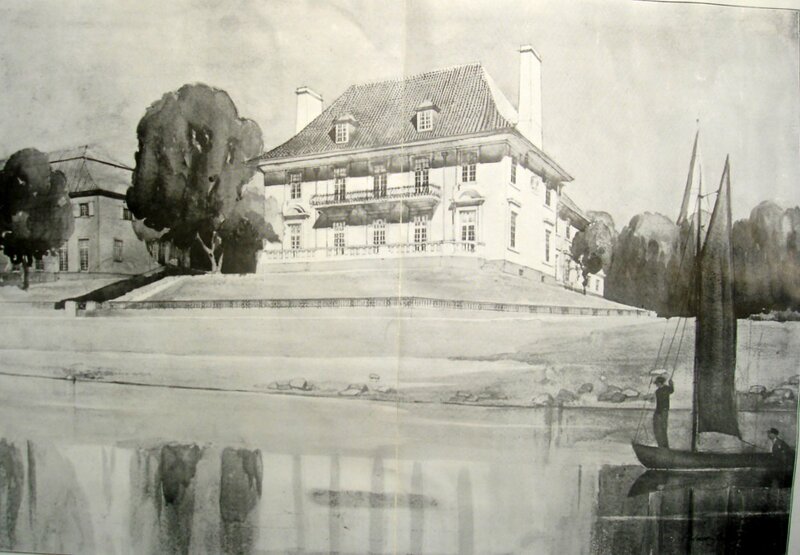 Allison worked with Count Cronstedt as the local executive architect. Building began in 1913 and was completed in 1915, at a total cost, including the site, of £23,500. The ambassador moved in, and the leased legation flat was given up. Allison’s house, now 8 Laboratoriegatan, remains the residence. Presentation drawing by William Palmer-Jones, 1915. 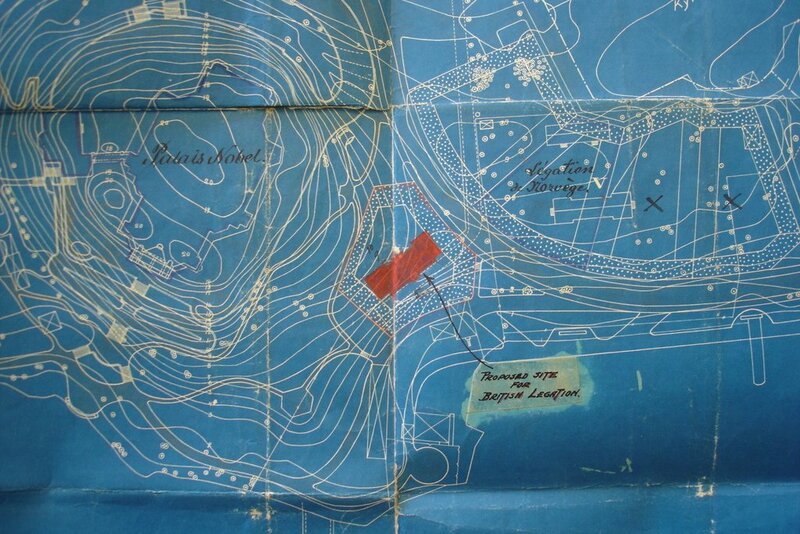 Ground and first floor plans, 1935. 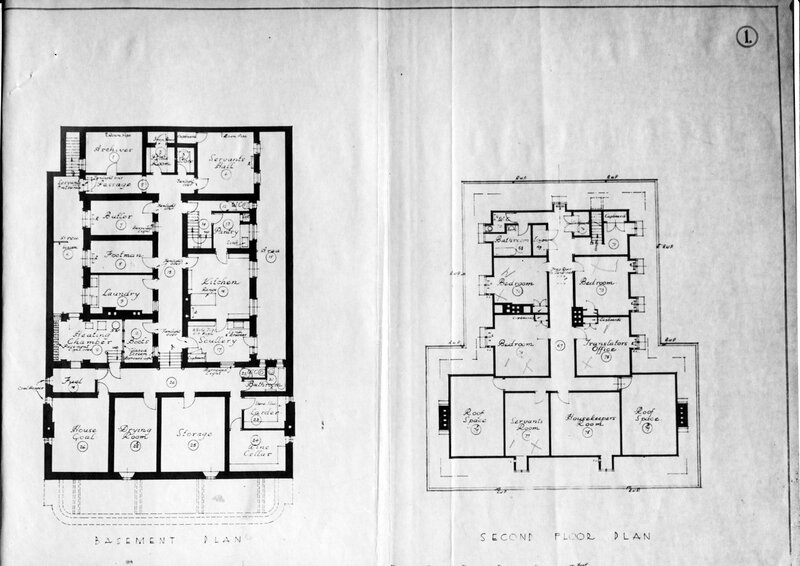 Basement and second floor plans, 1935. 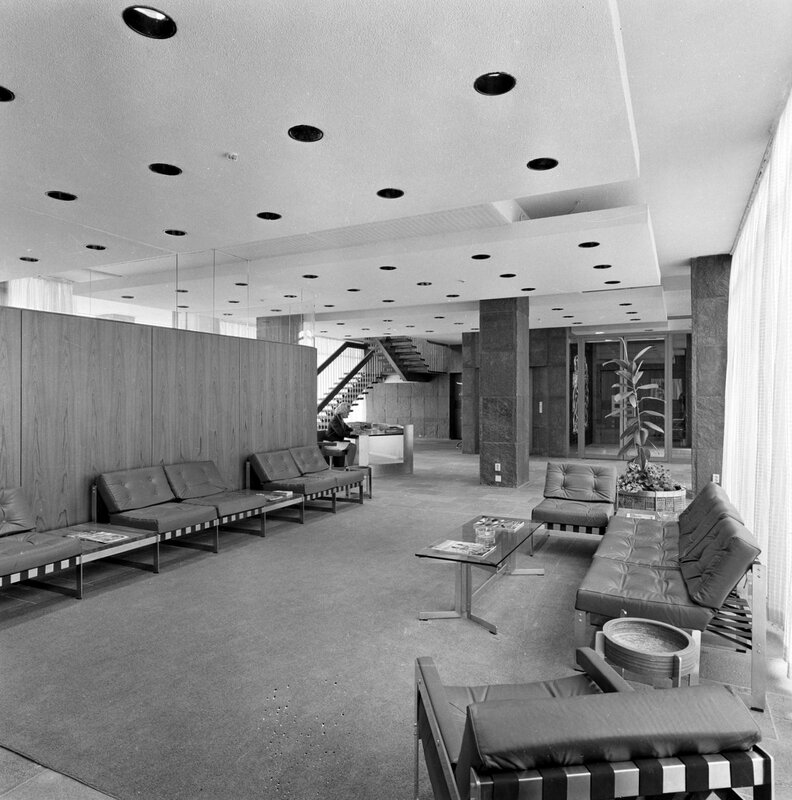 Reception room, formerly chancery office, 1967. 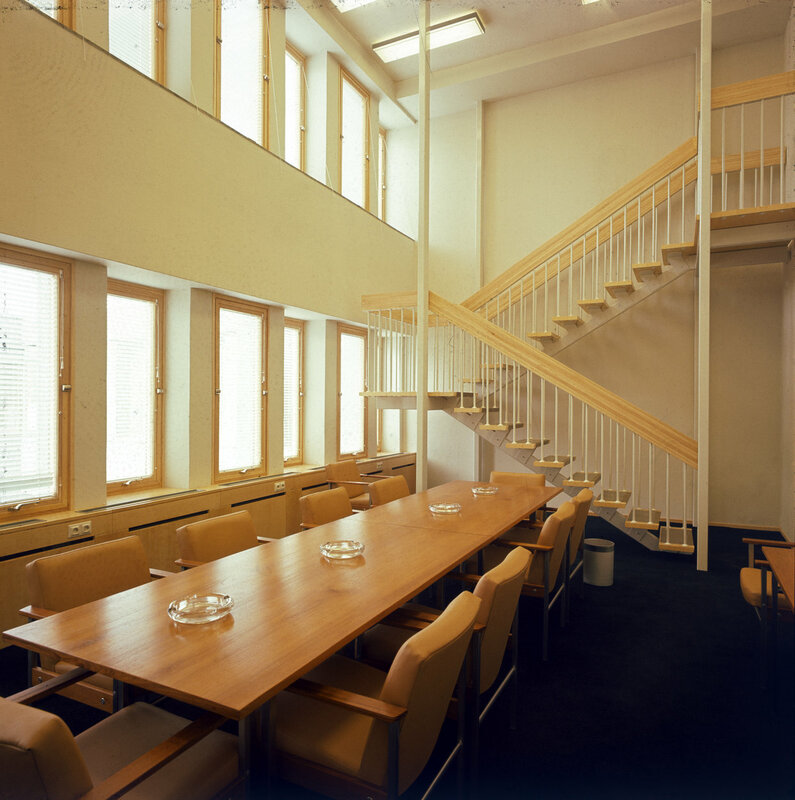 A site on which to build new offices was bought at 6-8 Skarpogatan in 1962 for £60,000. William Bryant, assistant chief architect at the Ministry of Works, is credited with the in-house design of the offices in a rectangular plan with two internal courtyards. The ground floor was mainly open and for parking, with the offices on the first and second floors. 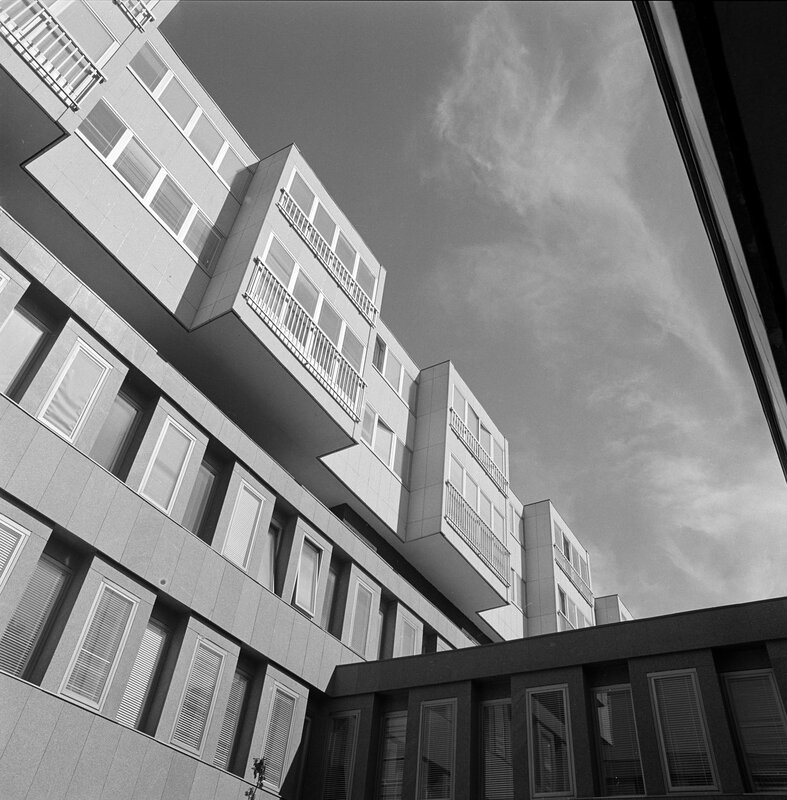 A line of duplex apartments lay atop one of the long sides of the rectangle, accessed from an external balcony at third floor level with vertical circulation at either end. The whole building was faced in granite: the ground floor columns and walls in blackish-grey Fjaras Gneiss, the offices in medium-grey Boafall, and the flats in light-grey Idefjords granite. 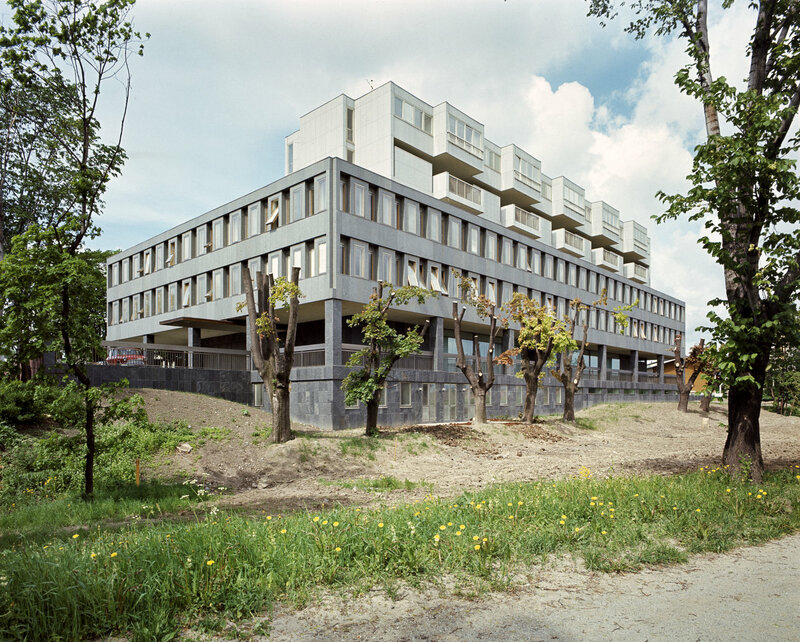 The associate architects were Bengt S Carlberg and the contractor was Byggnadsfirman Nils Nessen AB. 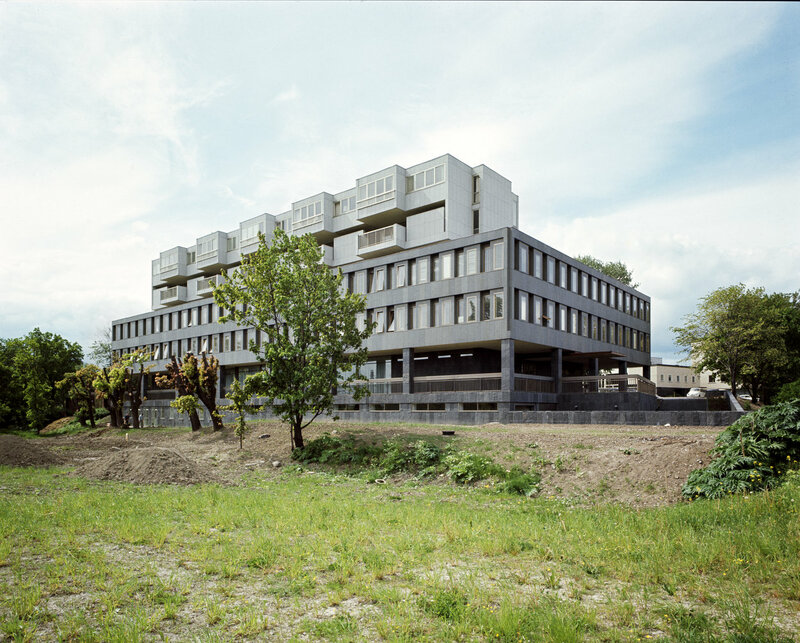 The cost was about £400,000, and the building was opened on 2 August 1967 by the Rt. Hon. George Thomson, a Foreign Office Minister. 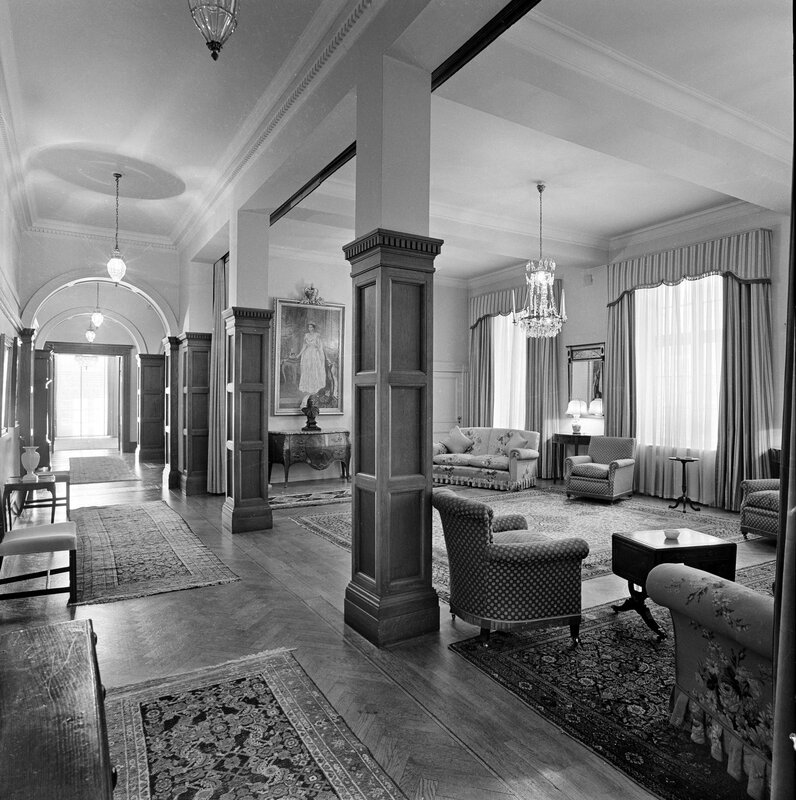 Most of the furniture for the entrance hall, reception areas and ambassador’s office was designed in-house by Alan Zoeftig. 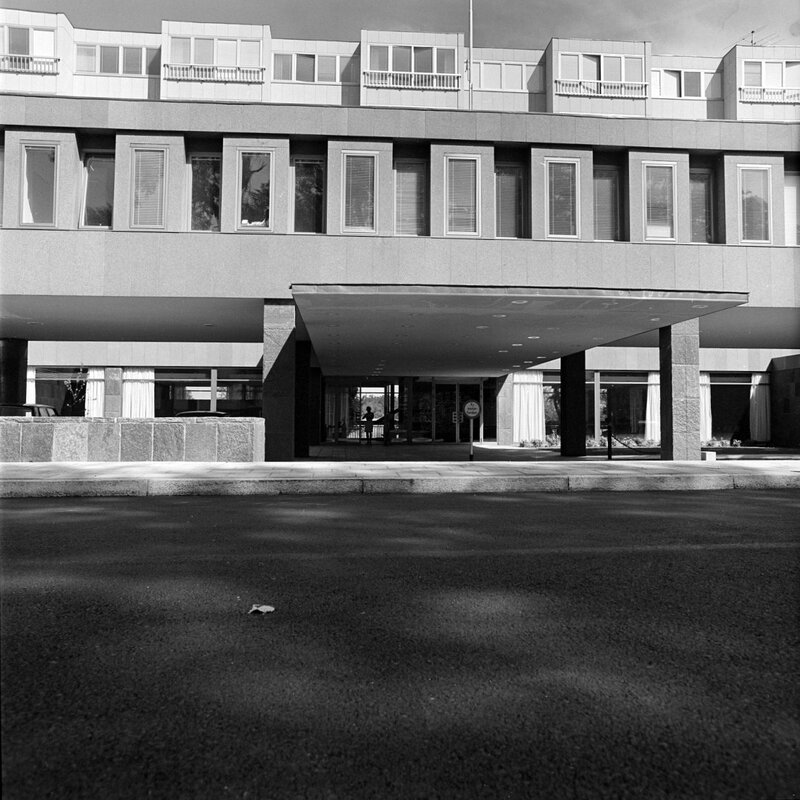 Looking north-east in courtyard, 1967. 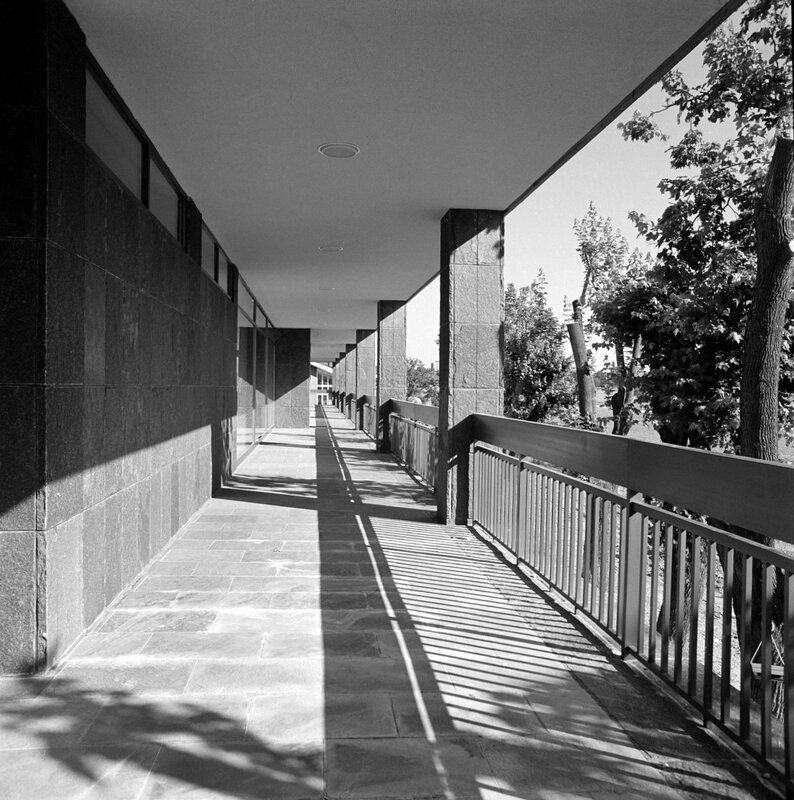 Access to staff flats, 1967.